"The Olmec were the first major civilization in Mexico following a progressive development in Soconusco. They lived in the tropical lowlands of south-central Mexico, in the present-day states of Veracruz and Tabasco. It has been speculated that Olmec derive in part from neighboring Mokaya and/or Mixe–Zoque. 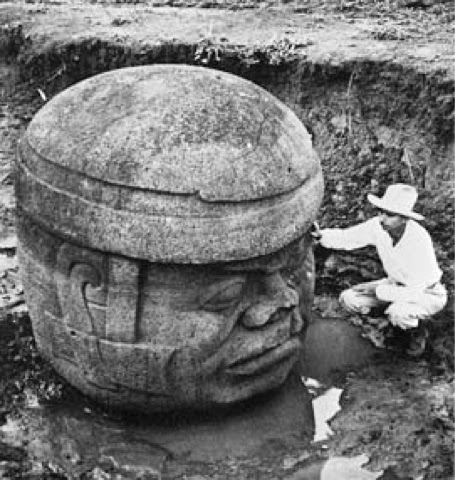 The aspect of the Olmecs most familiar now is their artwork, particularly the aptly named "colossal heads". The Olmec civilization was first defined through artifacts which collectors purchased on the pre-Columbian art market in the late 19th century and early 20th century. Olmec artworks are considered among ancient America's most striking."